Vote : Gauche ou Droite? 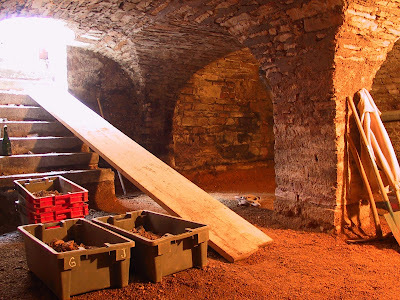 The Beaune wine cellar project is rocketing its way towards completion. Right now Franck and his “gang” of friends / tradesmen-who-have-become-friends are working on moulding the stair railing. A railing is a very necessary thing in a wine cellar. Trust me, after a true Burgundian winetasting going back up those stairs into the blinding sunlight can be confusing. Now the line of our railing may look a little…well…wonky to you. However, the railing is not wavy because the metal worker was drunk, but so that future winetasters are forced to follow the line of the rail and consequently duck their heads so as not to bean themselves on the huge slabs of stone that make up the 13th Century ceiling. But still, we have a dilemma. Now I’m confused, and I don’t even have a winetasting to blame for it. Au secours with your opinions please. Should the railing go on the right or left? 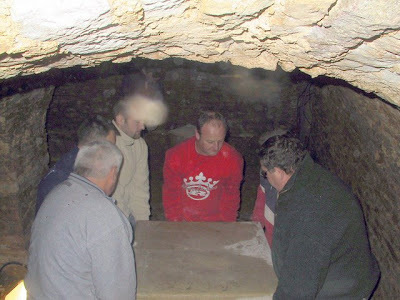 This entry was posted in Beaune Wine Cellar Project, Snapshots of French Life, Vacation Rentals R' Us on March 25, 2009 by admin. 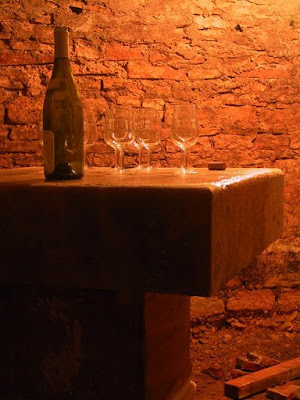 This entry was posted in Beaune Wine Cellar Project, Snapshots of French Life, Wine-Related Posts on February 9, 2009 by admin. Ladies and Gentleman…Check Out Our Racks! While I was left alone to fend for myself and try to erect and decorate our needle shedding, sapin miraculeux, Franck was busy working all last weekend with our mystery wine cellar consultant. 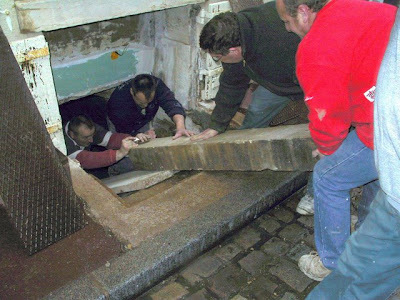 Over the past several months they have been busy in our basement pouring the concrete pieces of what is to become our wine racks in the Beaune cellar on carefully constructed frames. 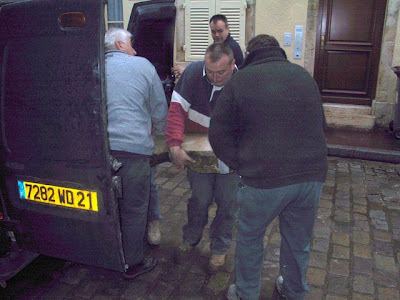 Last weekend it was time to take out all of the pieces, saw them apart, and then put them together like puzzle pieces in the Beaune cellar. 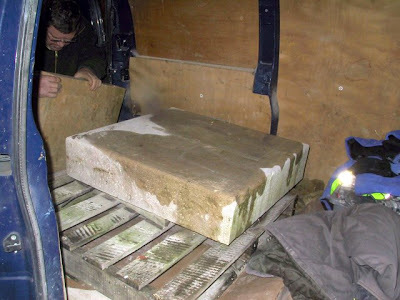 Sounds easy, I know, especially compared to my travails but the concrete pieces weighed about 100 kilos each and Franck and our mystery consultant are both what we would we refer to in France as “les forces de la nature” in regards to their capacity for physical labour. They lifted, sawed, and reassembled these 100 kilo pieces from 9:00am on Saturday to 10:00pm, then did it all over again on Sunday. They really earned the delicious tarte tatin I made them for dessert on Sunday, and the recipe for which (waving to Karen here) I’ll be posting tomorrow. This entry was posted in Beaune Wine Cellar Project on December 18, 2008 by admin. 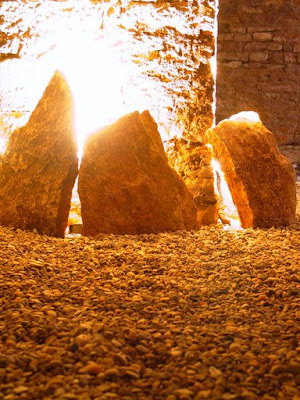 Our wine cellar in Beaune now has a gorgeous tasting table, a new lower stair (handy for getting out of the cellar after particularly decadent wine tastings), fresh pea gravel, power-washed stones, and Stonehenge-like atmospheric lighting. 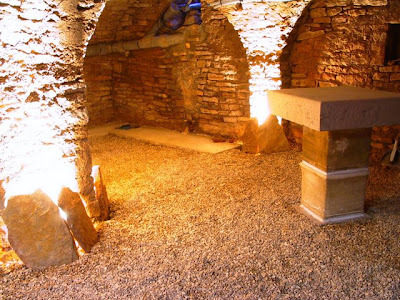 However, you may have noticed that one major component is still missing, especially when you consider what the main use of this cellar will be. That’s right, the main purpose of our cellar (besides the aforementioned decadent tastings) will be for storing wine under ideal conditions. And what does this require? You got it, somewhere to pile up all those precious bottles. 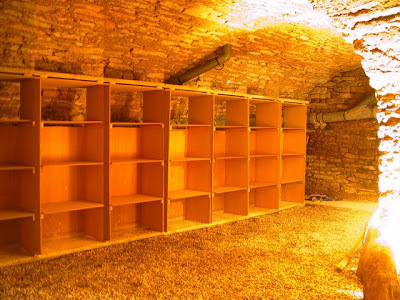 Now we could have gone the route of metal wine racks, but the idea is for us to store some wine that will not be locked up (ours and our family’s mainly) and then to rent locked wine storage space to guests of ours and other interested parties, such as local winemakers. Sort of like those self-storage units, but with a Burgundian twist. The traditional metal wine racks just aren’t flexible enough to allow this. 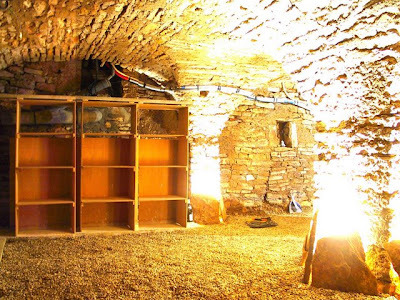 Enter Mystery Cellar Expert who, as you won’t be surprised by now, just happened to have a brilliant and low-cost solution. 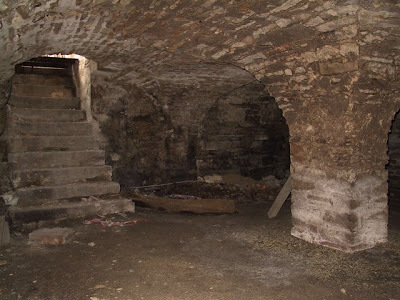 He strongly advised -he has very strong opinions on everything cellar related, and most things not cellar related too come to think of it – that he and Franck would create their own rack system out of poured concrete. They would create a series of concrete “shelves”, some of which can be covered with an aesthetic metal door and padlocked, while others can be left open. 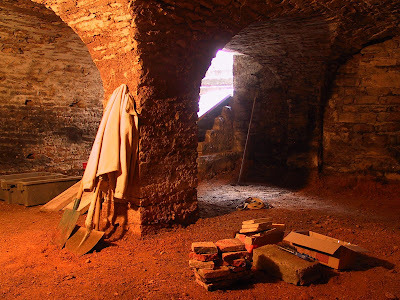 However, because our Mystery Cellar Expert is a stickler for doing things the right way (i.e. his way, which is virtually the same thing) first he and Franck had to do up a prototype in wood. Here it is, the template of our wine racking system (nicely highlighted by the new lighting if I do say so myself). Now we could consider the aesthetic and practical issues. Did it look too imposing? Did it hide that big water pipe on the wall? How many could fit side by side? How would they look lined up along one or two walls? Genial, quoi…the consensus was that these looked great, which means that over the next week or two the cement pouring can begin in earnest in Beaune. I’ll be sure to keep you posted! *Sigh* It’s nice to be surrounded by so many clever people. This entry was posted in Beaune Wine Cellar Project on February 27, 2008 by admin. 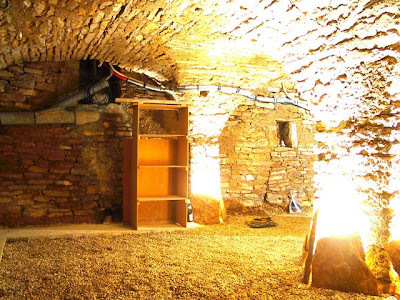 When we received the first electrical quote for the cellar in Beaune we almost keeled over. It was about ten times what we had anticipated, and when we asked the electrician mais, pourquoi? 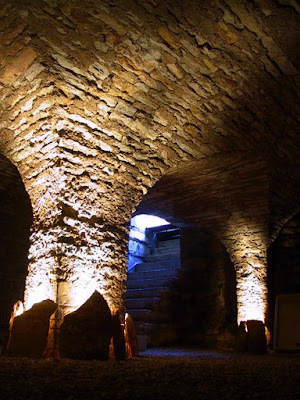 he banged on about how tricky and expensive it was to install atmospheric and indirect lighting to highlight the cellar’s pillars and vaulted ceiling. Franck had the clever idea of running this by Mystery Man aka The Wine Cellar Expert and he poo-poo’d the notion right away. All you needed were regular floor lamps, he said, some flat local rocks, and a bit of ingenuity. The floor lamps were no problem to pick up at our local Bricorama store in Beaune. The local rocks were a bit trickier. These cost a lot of money to buy from the stone quarry, but thanks to Franck’s Sunday bike rides with Martial he managed to source out some free ones. Ingenuity is never a problem when Franck is involved. 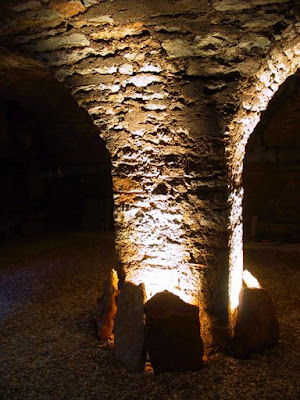 They used them to hide the (inexpensive) floor lamps and create a rather cool and spooky indirect light around the base of the pillars. Here they are again, and in my opinion they compliment our tasting table very nicely. I find the effect strangely makes me think of Stonehenge (or, more accurately Stonehenge as it was showcased in one of my favorite movies “This is Spinal Tap” where the stage directors get the measurements wrong). Can’t you just picture the little elves dancing around the base of our pillars too? This entry was posted in Beaune Wine Cellar Project on February 22, 2008 by admin. I am beginning to discover that having a newborn means that while “tomorrow” sometimes means “tomorrow” it could just as easily mean the day after that, or the day after that…one becomes very conscious of how time is a relative thing in newborn-land. 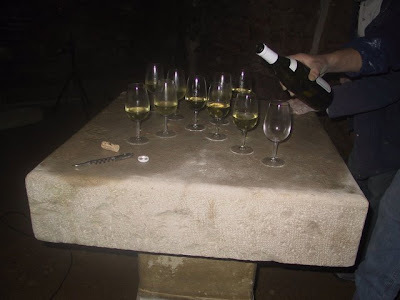 Anyway, back to how to get the 1000 pound stone table top (otherwise known as “The Beast”) from the back of Mystery Man’s truck down the steep stone stairs and into the cellar to finish off our tasting table. This, folks, is where Franck’s galvanizing personality comes in. When I look at the photos of PROJECT TABLETOP my first reaction is, who are these guys Franck is bossing around? For instance, take this senior citizen who looks like he is about to have a coronary as he considers the prospect of helping take The Beast out of the back of the truck. I’ve never seen him before in my life. Same goes for the guy in the striped Rugby shirt and the one with his back turned to the camera; I don’t know either of them from Job. 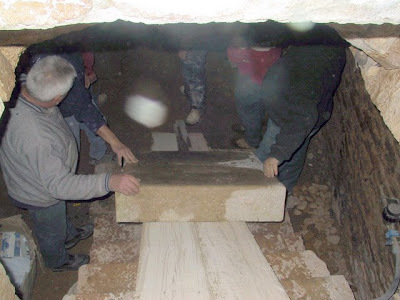 The photos show that Franck managed to round up at least six men to help, and as far as I can tell, only three (the stonemason, the mystery man, and Franck) have a reason to be there. However, I have lived long enough with Franck not to put it past him to rope in innocent bystanders. I strongly suspect that the other three men were probably taking a nice stroll down the rue Rousseau Deslandes, perhaps whistling in the wind or counting their centimes to see if they had enough to buy a baguette at the wonderful boulangerie at the end of our street, when they were unwittingly enlisted into PROJECT TABLETOP. And PROJECT TABLETOP is not finished yet. The Beast still has to be carried a few more metres over to the fabulous flower-pot table base. How do you say “hernia” in French? And move it just a leeeettttle bit this way. I can’t tell who this guy is from his shirt sleeves, but I’d wager good money that he wasn’t particularly popular at this juncture. Because of his bad back my Dad was the official photographer of PROJECT TABLETOP. I haven’t asked him but I am thinking it must be sweat from all these manly men that makes those blurry spots on the pictures. And doesn’t the table look perfect now? Besides, there’s something to be said for being involved in great artistic endeavors, a bit like the slaves felt as they laboured on the Pyramids in Egypt. You know, posterity and all that. And did I mention the good wine? 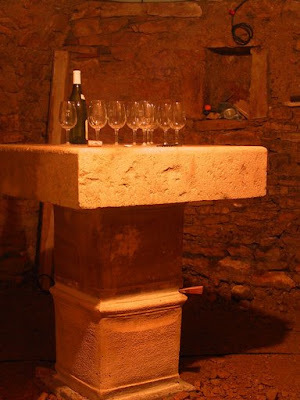 This entry was posted in Beaune Wine Cellar Project on February 17, 2008 by admin. Franck befriends people all the time, and over the past year he has become buddies with a man who shall remain nameless, as we don’t want him to get in trouble with his boss, who has been working on our street. Luckily for us, this mystery man also happens to be an expert on renovating wine cellars, as he has renovated some truly spectacular ones himself in places such as castles in Champagne and massive chateaux in Bordeaux. 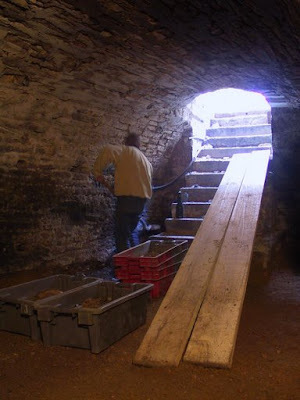 In the strange fortuitous way things seem to work here in France, their friendship has evolved to the point where mystery man has named himself de facto volunteer general contractor on our cellar project. He doesn’t want to get paid (god knows, we have offered), he just likes seeing a cellar renovated the right way, and I guess he enjoys working with Franck. He does things like spends three hours power washing the entire cellar with his own power washer, because that is the way it should be done. All he would let Franck do to thank him is take him out to lunch. Anyway, suffice to say that he is a miracle worker for us, and if our cellar turns out as lovely as I think it will, the credit should largely go to him. But it can’t, because his identity must remain a mystery. Zut alors. During one of their many long conversations Franck and mystery man concocted the idea of a tasting table, as our cellar is not only going to be used for storing wine for ourselves, our families, and our clients, but also for hosting tastings whenever we are able to swing it. 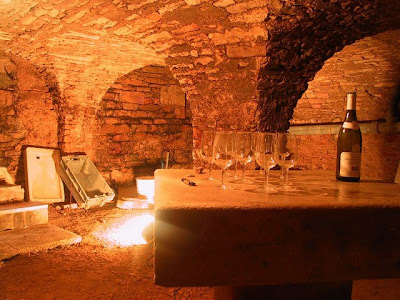 In my opinion wine never tastes as good as it does when you are tasting it in a real wine cellar, similar to how hot-dogs never tasted as good at home as they did at school in Canada during Hot Dog day. Looks like a real stone base, doesn’t it? Except that it costs about a twentieth of what a real stone base would cost. Next step was going to the stone quarry to pick out a table top. Franck, mystery helper, and my Dad all hustled off to the quarry that’s in the village of Chaux right beside us in Villers-la-Faye. My Dad figures it weighs about 1000 pounds. Seriously. 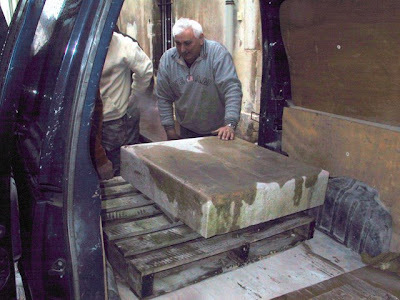 So now the problem is, how do mystery man, Franck, and my Dad who has a seriously bum back, get the huge slab of stone out of the back of mystery man’s truck and down into the cellar? This entry was posted in Beaune Wine Cellar Project on February 16, 2008 by admin. 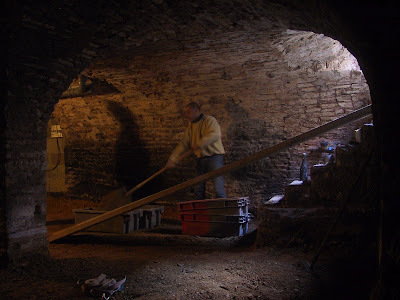 The first thing to do was dig, dig, dig as there wasn’t as much ceiling height in the cellar as we would have liked. This was a laborious process, not only was the ground hard and rocky, but all of the stuff that was dug up had to be hauled up to street level via those two wooden planks in plastic bins. Very heavy, sweaty work. So I guess it was no surprise that the stonemasons stopped after digging about half a foot, protesting they couldn’t go any further because of rock. Quitting when you become fed up isn’t something to be ashamed of over here, on the contrary it’s a French perogative. At this point my workhorse of a husband picked up a pick and a shovel and began to dig and pick-axe himself, shaming the masons into grudgingly picking up their shovels again and digging a full foot alongside him in a matter of hours. Here’s what it looked like by the end of that day – still a cellar, but with lots more head room to come down and have a comfortable tasting. And of course Franck broke out the wine at the end of the day, so the masons would come back the next time we needed them. For anyone doing any renos here in Burgundy, take note of this essential practice. And tomorrow will bring the next installment, when my husband and his mysterious helper perform magic and transform concrete planters into a tasting table…. This entry was posted in Beaune Wine Cellar Project on February 14, 2008 by admin. Over the past month while I have been busy having a baby, Franck has certainly not been resting on his laurels. 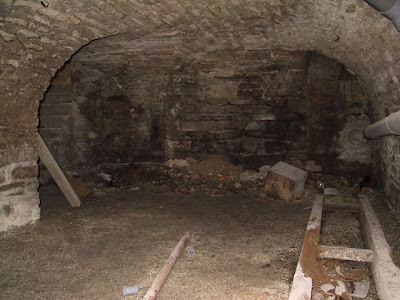 There has been phenomenal progress made in the cellar in Beaune, which as you can remember looked like this when we bought it along with the apartment which has since become Le Relais du Vieux Beaune. It had been unused for as long as anyone could remember so was very dark, dirty and full of cobwebs. Nothing had been done to bring out the good aspects, like the amazing stone pillar and the double vaulted ceiling. Tommorrow I’ll post the first batch of the amazing transformation photos. Must fly now – Clem is hungry! This entry was posted in Beaune Wine Cellar Project on February 13, 2008 by admin. 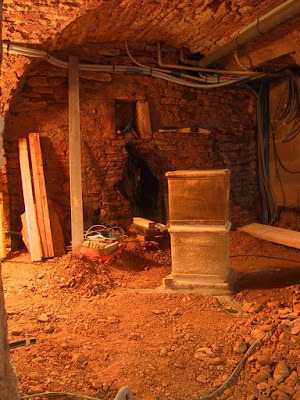 Excavation a Success, and no Jail Sentences Yet. 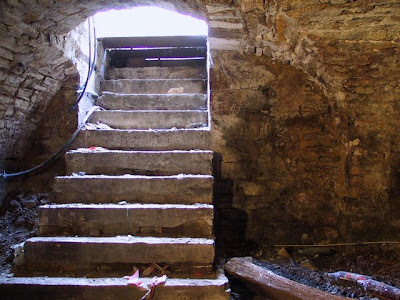 Nameless tradesman with three month suspended prison sentence, his workers, and as of yesterday morning, Franck, have been going at the earthen floor of the cave (cellar) under Le Relais du Vieux Beaune something fierce. We wanted to dig it out at least 30cm so that we had enough head room under the vaulted ceilings. 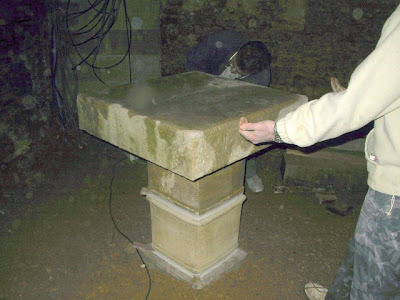 At first the masons decided only to dig out about 17cm, professing that there was “too much rock” to go any further. Franck, never one to take “no” for an answer, decided the best way to convince them otherwise was to go down himself armed with his trusty shovel and pick and show them that it was indeed possible. As the tradesmen’s manly pride could not allow Franck to outwork them, it has been a shoveling, picking, hauling free-for-all ever since. Now we have more than our 30 cm dug out as you can see in the photo above (Franck figures we got about 35 cm). He was quite a sight every time he ventured upstairs to the apartment – hair sticking straight up with sweat, breathing hard, and covered from head to toe in fragrant Burgundy dirt. Said dirt had to be dragged up the stairs to the daylight via these wooden planks, where it was dumped on the truck they parked across the street. Quite a job apparently, at least it looked that way every time I peeked down and wished the workers a rather feeble “bon courage“. It was a thirsty job too…Franck’s parents looked after the girls this morning and found it hilarious when Franck emerged from his subterranean kingdom to fetch the box of wine glasses and a bottle of Claire’s finest that he keeps handily beside the front door of the apartment. It was only 10:15am but apparently high time for a “petite breuvage“. We learned this essential rule while renovating La Maison de la Vieille Vigne – good wine is the best motivator of all. This entry was posted in Beaune Wine Cellar Project on November 28, 2007 by admin.